The parks of Pula, as well as other green areas of the city, abound in plant species, so there are altogether over one hundred different plants in the city parks. Some of them were planted at the end of the 19th and beginning of the 20th centuries during the Austro-Hungarian rule and then Italian rule. At that time many exotic species were planted which were not able to adapt to the climatic and pedological conditions (Carica papaya, Copernicia sp., Dasylirion sp., Taxodium distichum, Coffea arabica, Cyperus papyrus, Musa xparadisiaca, Phoenix dactylifera, Sequoiadendron giganteum etc. ), while others have survived until today (Sequoia sempervirens, Yucca filamentosa, Cedrus libani, Trachycarpus fortunei, Chamaerops humilis, Magnolia grandiflora, Pinus jeffreyi…). “(…) an Austrian scientific paper from the second half of the 19th century lists another 36 species of subtropical vegetation partly growing wild around the Bay of Pula and south Istria (…)”. (M. Balota, 1954). From the beginning of landscape gardening until the present, over 200 species have been planted in the parks of Pula: mostly during the Austro-Hungarian period (99), whereas during the Italian rule only 44 species were planted. Some of them have long since disappeared, others have adapted well and are planted even today. During the Austro-Hungarian rule, mostly allochthonous plant species and exotic species were planted in the pubic gardens of Pula, while only few were autochthonous, and are found in these parks even today. Although among the mentioned species brought from abroad are those that were not able to adapt to the new pedological-climatic conditions, so they either did not survive or they are in a poor state today, there is also a considerable number of those planted in that period, that are found in city parks today and truly have an ornamental function. The period of Italian rule was also characterized by planting of mainly allochthonous species, which in their country of origin had ecological conditions very similar to ours. Most of them acclimatized and adapted to the new surroundings very well, so they are well represented in the parks of Pula today. The older citizens of Pula vividly remember their city as a wonderful green oasis on the very south of the Istrian Peninsula. One will often hear them talk about bygone days, mentioning benches in parks, murmur of water from the fountains in Naval Park (Mornarički park) or at Monte Zaro, as well as the impeccably clipped hedge in all parks of that time. The trend today is to restore at least part of their onetime splendor. From the old postcards and photographs of the city of Pula, one regretfully sees that a greater part of such treasure has been lost forever. Today, parks are mainly used for easier and quicker communication between destination points, but rarely as a stopping point. Exceptions are certain age groups (children and pensioners) that spend a greater part of their free time in parks. Parks are only a small part of the rich cultural and historical heritage of Pula during the 3,000 years of its existence and therefore present an irreplaceable ornament with the valuable collection of plant species almost 150 years old. Owing to the mild climate and more or less successful selection of species, many of them, although exotic species or allochthonous, have survived until today so in their new habitat they have features of neophytes (flower, fructify and propagate without man’s help). 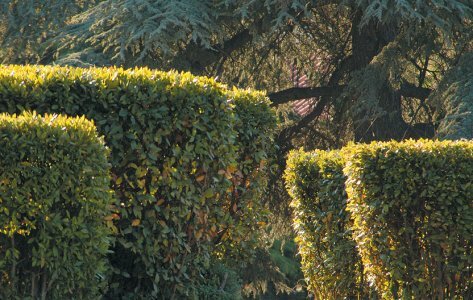 Over the past several years the old topiary technique of trimming and clipping plants in parks is being introduced again. These parks were once designed in such a way and the plant species present enable that technique. So, the parks of Pula are once again regaining their characteristic appearance.